At the weekend, 40,000 to 50,000 took to the streets of Moskva—Moscow—to protest their government’s actions in the Ukraine, at the Peace and Freedom March. I understand that media called the country’s actions ‘the shame of Russia’. A friend provided me with photos of the protest that he and his friends took, which I uploaded to my personal Facebook profile this morning. Within minutes, they vanished from my wall. Facebook has replaced them with a message to say my page cannot be loaded properly, and to try again. Seven hours later, the problem persists. They are still on the mobile edition but I’ve noticed that, for a public post, very few people have seen them. What is curious is whether Facebook has some mechanism to remove content. I remember some years ago, video content vanished, too, with Facebook making false accusations that I had uploaded copyrighted material—despite my having express authorization. I had to fight Facebook, which had adopted a guilty-till-proved-innocent approach, to keep up content I was legally entitled to upload and share. Facebook presented me, for months, with a massive notice on my home page each time I logged in, where I had to fill in a counter-notification daily to their false accusations. I had understood that generally copyright owners had to complain first under US law, unless, of course, your name is Kim Dotcom and US lobbyists want to make an example of you. So we know that Facebook does have mechanisms to take things off without any complaint being filed. And we also know there are algorithms limiting sharing. Given the speed with which this vanished today, I doubt anyone would have complained—and I’m hardly a target for those interested in Russian politics. I have since uploaded the album to my Facebook fan page—where it has not been deleted, but stats for it do not show up. Thanks to Facebook’s actions, I’ve uploaded the five images to my Tumblr as well—and here they are again, for your interest. We can credit Facebook for ensuring that these images were more widely shared. The spirit of Gene Hunt is alive and well in the Greater Manchester Police, in the form of Sgt David Kehoe. Arresting someone over drink driving when he has neither drunk nor driven reminds me of The Professionals episode, ‘In the Public Interest’, about a corrupt police force in an unnamed English city outside London. The only thing is: that was fiction. This was fact. So, IGas Energy plc, you may frack away. The British Government and the Met have your back. Dr Steven Peers was the cameraman and citizen journalist who was arrested. CPS did not have sufficient evidence to proceed with a prosecution. I wonder why. He is now planning to bring a civil claim against the GMP for ‘wrongful arrest, false imprisonment and assault,’ according to the Manchester Evening News, which appears to be the only mainstream media outlet I could find that covered this incident. Another report claimed that the GMP never received a complaint from Dr Peers, though how are we supposed to believe any statement from this force? The video has gone viral, and global—and if Operation Weeting and the inquiry into police standards were insufficient to give the Met a bad name, then this surely will. What next? Legislation to make protests against oil companies illegal? No, that would be daft. It would totally be against the ideas of free speech, human rights and international law. No democracy would be that stupid. Those of us who enjoy a free press need to use it and not take it for granted. We might not always like what’s being said, but we should embrace the fact that we can say it at all. 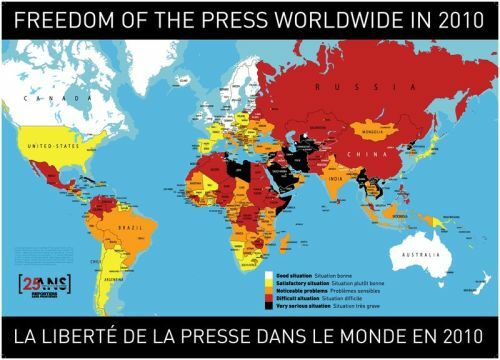 I was surprised to see that the US did not have a fully free press, according to this map from Reporters sans Frontières, which classes it with Chile, Argentina, France, South Africa and Japan. In fact, there are few of us that seem to be in the white—especially when you factor in the small populations of Australia, New Zealand and Scandinavia. The fact there are still countries in the black—the colour used here to represent a grave situation for press freedom—is also disturbing. Some communist nations, parts of the Middle East and Africa and several former Soviet states have very little press freedom. Anyone want to come up with some theories on why the US, France and Japan—developed countries I would have thought would come up in the white on such a map—are in second place when it comes to press freedoms?